One day’s strike on 8th January, 2016 by all members working in all the Banks including the Associate Banks. •	Do not violate Bipartite Settlement – Maintain sanctity of bipartite settlement. •	Do not impose SBI service condition and career progression in Associate Banks. •	Extend compassionate appointments in Associate Banks as per Govt guidelines. •	Increase quantum of staff housing loan in Associate Banks. Last month when we issued the strike notice for strike action on 1st and 2nd December, 2015, there was conciliation meeting before the Dy. CLC, Delhi on 23-11-2015. In this meeting, it was pointed out by us that all the Associate Banks are parties to 10th BP Settlement and the managements of all the 5 Associate Banks had given independent mandate to the IBA to be covered by the Settlement. There was no condition or linkage either from the SBI or from the Associate Banks that SBI service conditions would be made applicable in the Associate Banks. Neither there is any agreement providing for extension of SBI service conditions in Associate Banks. In each of the Associate Bank, there is a recognised trade union and in addition to the State Sector Bank Employees Association covering all the 5 trade unions in the Associate Banks functioning under the umbrella of AIBEA. Our Unions and SSBEA have been negotiating the settling the service conditions in the Associate Banks in addition to the industry-level Bipartite Settlement. In SBI, even though they are covered by the industry-level bipartite settlement, there are specific provisions to arrive at different service conditions in some of the aspects like duties and allowances, mobility, retirement benefits, etc. These are not applicable to other Banks. In the conciliation meeting, IBA also stated and reiterated that 10th BPS is applicable to the Associate Banks since they are all parties to the Settlement. Hence we protested against the unilateral and illegal action of the managements of Associate Banks to foist the SBI’s Career Progression Scheme which is arising out an exclusive settlement in SBI between SBI management and the union in the SBI and Associate Banks are not parties to that settlement. Associate Banks are governed only by the industry-level settlement besides in-house settlement with the respective unions and SSBEA. We also pointed out that Government guidelines/IBA guidelines on staff housing loan and compassionate ground appointments are not being adhered to and implemented in the Associate Banks in utter disregard to these authorities. However, as per the advice of the Dy CLC, we offered to resolve the issues by mutual discussion and when the managements offered to defer the option letters under the CPS scheme and hold bilateral talks with SSBEA, we are also readily agreed to defer the proposed strike action on 1st and 2nd December, 2015. But we regret that in the discussion held on 3rd December, 2015, the managements have maintained that CPS stands already decided by the Boards of the Associate Banks thus precluding, preventing and negating any meaningful discussion or resolution of the issues involved. It is also a matter of concern that IBA which has signed the Bipartite Settlement on behalf the parties to the settlement based on their specific mandate is not playing its expected role when the Settlement is violated by some of the parties to the settlement. Since the violation of BPS is continued and since the unilateral imposition of the CPS is persisted, it has become necessary to re-launch the agitation and strike action. Accordingly, it has been decided to observe agitation programmes and All India Bank strike on 8th January, 2016. The details of the programme are furnished herein. 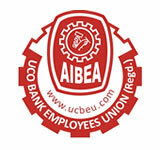 The Circular issued by AIBEA is furnisheded herein explaining the demands and issues and the reasosn for the Strike.